The purpose of this article is to serve as a general strategy guide with tips and advice that you should follow when attempting to win a large sandwich challenge. There are many different varieties of sandwich eating challenges all around the world, and they come in all shapes and sizes. Some consist of barbecue meats and others involve deli meats. Then there are others which consist of fried foods and/or other meats such as meatballs. The most common type is the very popular Philly Cheesesteak sandwich, but Reuben sandwiches are fairly common too. You won’t find many vegetarian-oriented sandwich challenges, and most do have meat on them. Some challenges consist of just one massive sandwich, but then many others include sides as well such as french fries, onion rings, chips, potato salad, coleslaw, and/or baked beans. Then there are a few others which require their challengers to finish multiple sandwiches, and some involve breaking the restaurant’s sandwich eating record! Even though there are many different variations you may encounter, the basic strategy you need to have remains similar for every variation. Before we go into the specific strategy details for winning a large sandwich challenge, please make sure you have read and understand our Basic Strategy For Winning A Food Challenge article. It’s full of 14 different general strategy tips that won’t be included in this article, which you need to understand before attempting a sandwich challenge. Please start off by watching our very informative How To Win A Sandwich Challenge video so that you can visually see all of our different tips put into practice during an actual sandwich eating challenge. 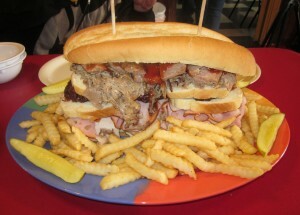 For this video, I attempted Marc’s “Meatier Mountain” Sandwich Challenge at Bronx Deli in Farmington Hills, Michigan near Detroit. During this challenge, I had to finish a sandwich with two pounds of deli meats served with potato salad, french fries, and a bowl of matzo soup all in less than 30 minutes. Winners get the meal free, a t-shirt, and their name/photo posted on the Wall Of Fame. We are still working on writing the rest of this article and hope to have it completed soon! Hopefully the video answers most of your questions, and sorry this is not finished yet.